Bulgar, the capital of the ancient state of Volga Bulgaria (8th−13th centuries), located some 200 kilometres from Kazan, today bears little resemblance to a town. However, once this was the place where the Khan's headquarters were located, original coins were minted, life was bustling, and traders praised goods brought from different parts of the world or made by local craftsmen. The first mentions of Bulgar date back to the 10th century. This was the time of a historic event for Volga Bulgaria and its descendants to whom modern Tatars consider themselves to be part of − the adoption of Islam in 922. One reason for the change from Tengrism (an ancient religion at the junction of ontology and cosmology, which was often practiced by Turkic peoples), which the Bulgars followed, was the fact that they needed help in their struggle against the Khazar Khaganate, where Judaism was professed, and the Bulgars were dependent on the Khazar Khaganate. In addition to receiving support from Baghdad, whose Emir was considered the sovereign of all Muslims, the change in faith, according to some historians, facilitated the transition to a sedentary lifestyle, which replaced the nomadic one. After the fall of the Khazar Khaganate in 955, Volga Bulgaria became independent. And just like any typical medieval state, it began to war with its neighbours, including Russian principalities, to conclude trade agreements and armistices with them, to capture the towns of other states and to lose its own towns. This continued for several hundred years. The first troubling harbinger of things to come was the appearance of the Mongolian army, which set foot in the land of the Bulgars at the end of 1223 and the beginning of 1224. This time the local people were victorious, but the Mongolian revanche took place as early as 1236, when their commander Subedey ravaged Volga Bulgaria. Four years later, it completely lost its statehood in becoming a part of the Golden Horde. Ironically, the city itself benefited from this. It was in the Golden Horde period that the vast majority of the major structures were built. For some time, Bulgar was even the location of Batu’s headquarters − until the city of Sarai Batu was built. The second half of the 14th century was the next unfortunate period for the city, when it was captured first by Bulat Timur, a Golden Horde emir who longed for power, and then, at the end of the century, by Tamerlane − the founder of the Central Asian Empire of the Timurids. Somehow the city recovered and existed until 1431, when Fedor Pyostry, a provincial governor of Vasily Tyomny (Blind), the Prince of Moscow, administered the coup de grace. Since then, Bulgar has found itself finally abandoned. This brief and far from complete historical review gives an idea of how much was witnessed and experienced by Bulgar and its inhabitants. The city was reborn in the last century, when in 1969 it was decided to establish the State Historical and Architectural Museum and Reserve here. Excavation work, which have been carried out extensively until this day, and restorations have turned the dead and abandoned site of the ancient city into a huge open-air museum. In fact, the provincial governor of Moscow’s Prince completed what the founder of the Timurids Empire started – and most of the city’s legends, which have survived for centuries, are associated with his name. The most famous of them is the story of Kara Pulat, or the Black Chamber. It was here, in the court chamber building, that the family of Abdullah Khan was hiding when warriors of the ruthless Tamerlane stormed the city walls. The defenders fought bravely, but Tamerlane's thousands broke through the walls, and the slaughter began. The city was burning. The fire, among other buildings, engulfed Kara Pulat. The daughter of the ruler climbed onto the roof, escaping from the flames. Tamerlane, who happened to be passing by in the conquered city surrounded by a large entourage, spotted her and noticed that the white clothes in which she was dressed were not only uncharred, but not even covered with soot or grime. The formidable conqueror decided that it was a sign from above, and addressed the girl, offering her to come down and marry him. However, she refused. Then, by the order of Tamerlane, two captive brothers of the girl were brought to him, and the conqueror repeated his proposal of marriage while threatening to kill her brothers. "All right, give the fastest horses to my brothers, and after they have disappeared over the horizon, I'll come down," said the girl. They did as the Khan's daughter asked them to, and after her brothers had fled to safety, she jumped into the fire. The first thing that catches the eye when approaching Bulgar is the wooden gates of the fortress, reconstructed in the image of the old city fortifications, which puts the traveller into a special mood. And the appearance of the gates precedes a meeting with the medieval East on the banks of the Volga river. If you visit this place as part of a tour group, it is likely that the first place in the museum you will visit will be the Mausoleum which is beautifully situated on the high banks of the Itil river and decorated with a golden crescent. The main purpose of this structure is to house the world's largest printed Quran. The half-tonne book, due to its size, is mentioned in the Guinness Book of Records. The lower floor of the building hosts a museum devoted to ancient Volga Bulgaria. However, the centre of Bulgar is a little further along the Volga river bank, in the midst of the ancient buildings: the Cathedral Mosque with its large minaret, the Northern Mausoleum, the depths of which hold tombstones containing the only surviving examples of writings from Volga Bulgaria, the East Mausoleum which is the tomb of the nobility, as well as the Khan's Bath and Palace with stone masonry constructed from bricks of a "local" brand, which are very different from conventional contemporary ones. If you look closely at any of the historic buildings in Bulgar, you can spot a thin red line, which looks like electrocardiogram pulses around the old masonry – this line has been put there by modern builders to show where the separation between their work and the masonry of their predecessors lies. If it is interactive experience that you are looking for, it is worth dropping in to the Bread Museum – an ethno-cultural complex that relates mostly to the history of the Tatar people and their customs, as well as to the post-Bulgarian and even post-Horde period. Within the vast area of this museum, all the things that are needed to make bread are on display – from arable land to a baking stove. There are two mills – a windmill and a water mill with a pond where ducks and geese swim, a barn with different kinds of grain guarded by a vigilant but very friendly grey cat, and the miller's house, which is the ethnographic part of the exhibition. The goodbye part of the tour to Bulgar can be a visit to Tatarstan's Taj Mahal. It is the famous mausoleum mosque in India’s Agra that the majority of tourists associate with the White Mosque built here, although, needless to say, the local version is smaller. All who have seen it, regardless of their religious affiliation, note its elegance and correctness of forms, as well as its compliance with architectural proportions and beauty – not modern, but ancient oriental beauty. 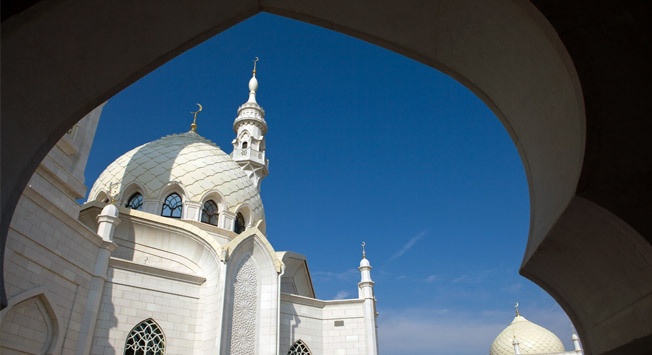 The White Mosque, with its presence, would have perhaps honoured the Caliph of Baghdad, if it had been moved with the efforts of some genie under the scorching sun of the Middle East.